A pool safety cover is defined by the American Society for Testing and Materials (ASTM. The F1346-91 standard (1996) requires that a pool cover must hold a minimum of 485 pounds per five square feet to qualify as a pool safety cover. Not all inground pool covers are safety covers. Swimming pool safety covers protect children and small animals from accessing the pool or water that has collected on the top of sagging pool covers. The covers are taut and anchor into the cement with recessed brackets. The two types of pool covers that are available are mesh pool covers and solid pool covers. There are several manufacturers that make a safety cover. Some of the common ones are Artic Armor, Raynor and Loop Loc covers. Mesh pool covers allow water to drain through the cover so that it doesn't collect on the top. In the past one of the disadvantages of a mesh swimming pool cover was that it also allowed UV light to enter as well. However, new technology can block up to 99% of UV light which means less opportunity for algae to grow and helps to retain more of the pool's chemicals. The advantages of a mesh pool cover are that they are lighter weight and allow water/melting snow or ice to drain into the pool rather than accumulate on top causing it's own safety hazard. Solid pool covers either have a single, center mesh square to drain water or require a pool cover pump to remove any standing water. Solid covers prevent almost all UV light from entering the pool - which means no algae can grow and more of your pool chemical are protected. Loop Loc pool covers were developed in 1977 by Bill Donaton. He was a man who was devoted to providing safety to the swimming pool industry. Their pool safety covers are best known for the strength of their cover by showing Bubbles, the elephant, walking on top of it. LOOP-LOC Covers not only meet, but they exceed the American Society for Testing and Materials (ASTM) standards for Safety Swimming Pools Covers F 1346-91. All LOOP-LOC covers have undergone extensive outside testing through Underwriters Laboratories (U.L.) and have earned the U.L. seal of approval for safety swimming pool covers. These covers are a well known safety inground pool cover that protects your pool and provides safety at the same time. They must be installed by pool company installers. Many of our local pool dealers use and recommend this manufacturer. Loop Loc Pool Covers are best known for their high quality and safety standards. If you are interested in not only covering your pool for winter, but also want to protect small children and animals this may be the pool cover for you. In order for a Loop Loc pool cover to be considered a safety cover, they need to be installed by a professional pool contractor. This cover cannot be installed by the pool owner. Not all swimming pool covers are considered a pool safety cover. A pool safety cover prevents water from collecting on the top of the cover either through mesh drainage fabric or with a pool cover pump. Contrast the mesh pool covers with a solid waterbag pool cover - they can become dangerous after a few rains. The water sits on top of the cover, the weight of it sinks the cover so that it sags. The water can become deep depending on how much rain there is and can become a safety hazard to animals and small children. 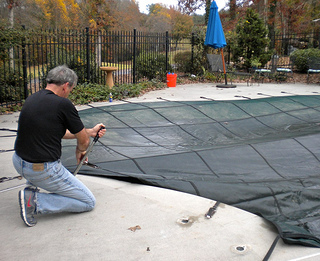 Mesh pool covers stay dry by allowing water to drain through it. 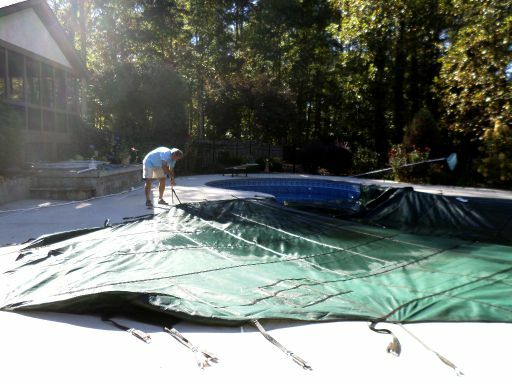 Pool cover pumps remove any water from a solid pool cover allowing it to stay dry. Loop Loc has developed a new ultra strong mesh that's made with a new denser weave that according to their website "blocks virtually all sunlight but still lets rain and melting snow easily drain through." The reason you want to block the sunlight is to prevent the loss of pool chemicals and the growth of algae. 1. Available with mesh drainage panels. The drainage panels allow water to drain into the pool and not collect on the top. No need for a pool cover pump. 2. Available without the mesh drainage panels. Cover without drainage panels blocks 100% of sunlight and is sold with an automatic pump, which must be used at all times to meet ASTM safety cover standards. They are made from 100% polypropylene (0% Vinyl). 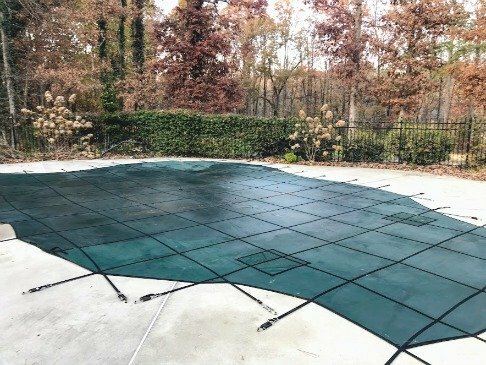 Even though it is super strong, these solid pool covers are much lighter in weight than typical solid vinyl covers, which makes it much easier to handle. If you have an odd shaped pool like we do, it is important that you find a company that uses a computer aided design software. First the pool contractor must come out and carefully measure the pool. Then the computerized design system will make a custom pool cover that will provide a perfect, custom fit for any shape or size pool. If you have a hot tub or spa that is part of your pool design, Loop Loc has a patented SAFEEDGE and GAPGUARD Child Safety Intrusion Barrier. "All LOOP-LOC mesh and solid safety covers come with a 12-year pro-rated manufacturer's warranty. When completed and signed by the original purchaser, this warrants that the cover is free from defects in material and workmanship under normal use." Pool anchors attach to the cover's straps to hold the cover taut. There are a variety of pool cover anchors. It all depends on what material the anchor is going to go into - the most common is cement or concrete but other material would include brick, asphalt, a lawn or grass, and a wood deck. After years of owning a mesh pool safety cover, we've had to replace the brass anchors - but thankfully that's a pretty universal easy to replace part thanks to Amazon. 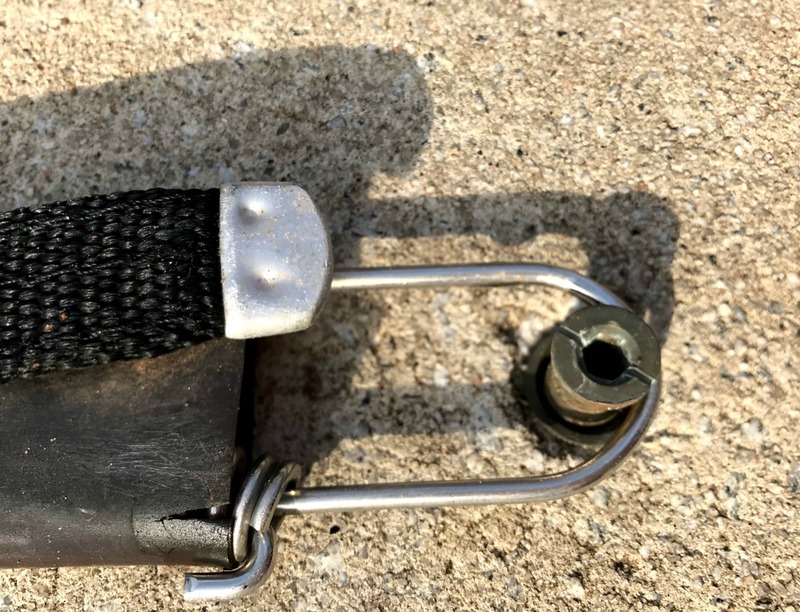 This set of ten 5/8" anchor fits 3/4" hole and is designed to work on a concrete deck. There are different recommendations as to how much space is needed from the edge of the pool to attach the pool anchors. The range is usually anywhere from 2 feet to 2 1/2 feet. In order to prevent stubbed toes, it is important that the anchors are flush with the cement. After the pool cover is removed the anchors can be screwed down so that they are flush with your pool decking.